Sonia Household Solutions - 4 Pack - Vacuum Storage Bags - 50cm x 70cm - Medium Bags, Safe, Space Saving & Dust Free. SHRINKS STORAGE UP TO 75% - Airtight & watertight Protection. Reusable and Ideal for all types of textiles. SIMPLE STEPS - Place item in the bag. Using any household vacuum, Place the nozzle of the vacuum over the air vent and switch on. Once the vacuum bag has reduced in size by 75% switch of the vacuum. SPACE SAVING - No Mould or Moisture. No Dirt or Dust. No Musty Odours and No Mice, Insects or Moths. hen you're travelling and want the MOST space so you don't have to take a lot of luggage, these storage bags are PERFECT! 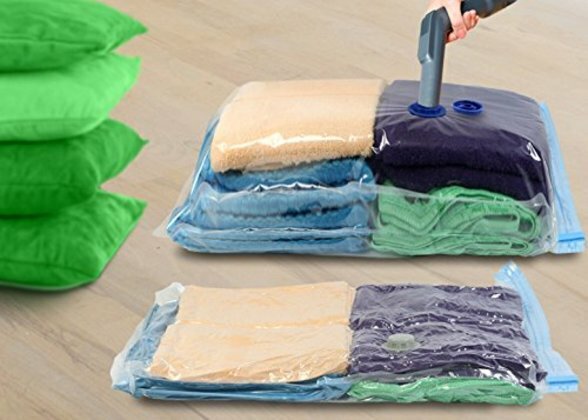 And when you have to re-pack for the return trip, just use our FREE convenient Travel Pump, and your bags will be air-tight vacuum-packed again.